From on MiMi to another ,Congrats on the new grandchild. Our ODS is deploying again in a few days. This is the 4th time. But it's the only time he's dreaded it and not wanting to go. They had their 1st child last Nov. he is a hands on Daddy and so in love with him. Thank your son for his sacrifice . Thank you and same to you. Skype has been wonderful for them when they were separated and it will be again next year. You are going to have to wait until it's born! Lol. They just found out it's a boy. Not due until April. YAY! A beautiful son for DIL!!!! Pooh, I only hope that your example of love and respect will carry over into your GS lives and they will keep their mom in their hearts and lives as they choose a bride and start a family. Blessings to you and your growing family!!!! Oh, that's so funny! 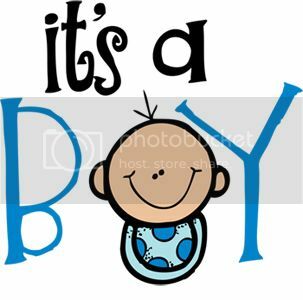 I date back to 'It's a Boy' being a birth announcement! Woops! Yeah, I didn't think about it until you commented and then went "Duh!" it looks like I announced his birth! FL, I hope they both remain close with their Mom. She and YS are doing great as parents! They will be here in 8 days! I can't wait! How is DIL doing, physically? I know she had a really rough time the first time around. Health wise, she is doing fine but she has been extremely sick this go around. Looks like she lucked up and got perpetual morning sickness, all day, every day this time. Bless her. Last time she did well up to the last couple of months and then her placenta started giving out early. Turned out fine but they took him a couple of weeks early. Oh, now I remember. And do I ever remember the 'nausea for 9 months' trip! Beyond awful!